Johnnye Merle's Gardens: Lots of new goodies! We hope you are all enjoying a lovely, relaxing Sunday morning! Our gardens are looking mighty lovely right now, full of plants waiting to go home with YOU! We received a bit order of Annie's Annuals this past Friday. 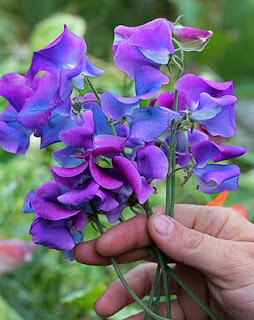 Our new sweet peas this week include "Blue Shift", pictured below, as well as "Black Knight", another unusual, fun favorite! 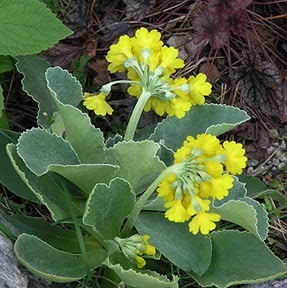 We discovered Primula "Yellow Bear's Ear" while pricing and cleaning up yesterday - REALLY cool plant, the photo doesn't do it justice. The gray foliage almost looks like a succulent! Hope to see you soon! Enjoy this AMAZING fall weekend!